Explanation: A larger moon will not be seen this year. This past weekend, the largest full Moon of 2009 could be seen from almost any clear location on planet Earth at night. The large angular extent of the full Moon was caused by the Moon being unusually close to Earth during its full phase. Because the Moon circles the Earth in an elliptical orbit, its angular size depends on how close the Moon is to closest approach (perigee) or farthest distance (apogee). Even so, the Moon's was only about 15 percent larger in area and brightness than a more typical full Moon. In this image, a dramatically positioned Moon is seen rising above the Alps from Breil-sur-Roya in the southeast of France. Taken with an ordinary digital camera but extraordinary timing, the image also captured a crossing jet plane. 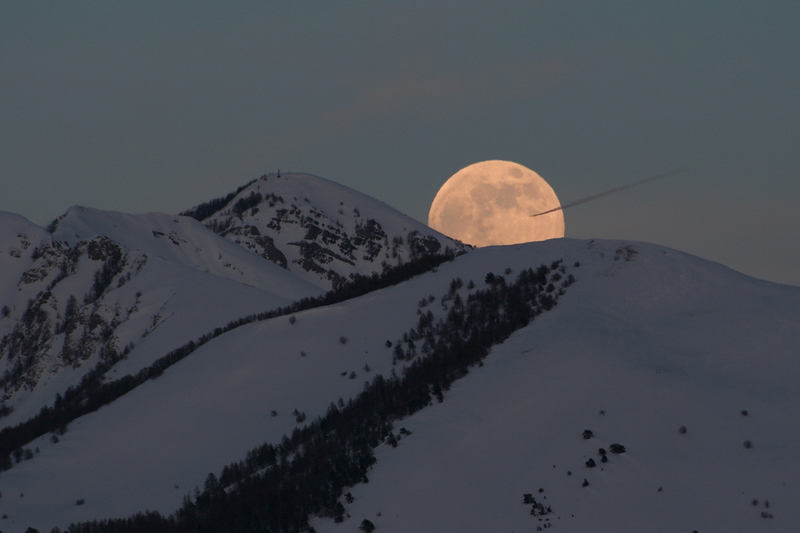 The last full Moon, in 2008 December, was the largest full moon of 2008. Tomorrow's picture: drawing or photograph?